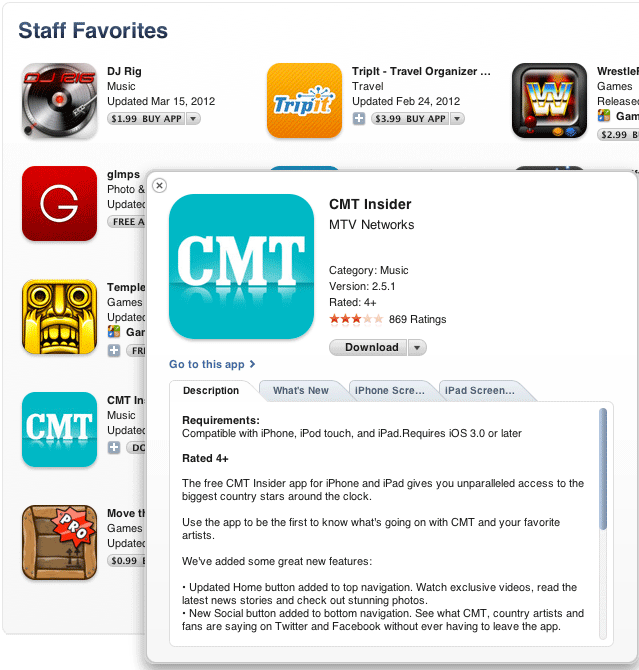 On March 5, 2012 the CMT Insider App was published to the Apple App Store. 10 days later Apple has featured it in the Staff Favorites section of the App Store. Watch exclusive music videos and clips from your favorite CMT shows. Customize a grid of your favorite artists. Read articles sorted by artist or browse all of the latest headlines. Scroll through celebrity photos from CMT events and more. Find out when your favorite artists will be touring near you. Share news articles and photos on Facebook, Twitter, SMS or e-mail a friend. We are honored that MTV selected us for the iPhone app development and honored that Apple picked it as a Staff Favorite. RustyBrick designs premier iPhone & mobile applications for the Jewish market. They also work with clients such as MTV, Harper HarperCollins, Comedy Central, Harvard University and many more.